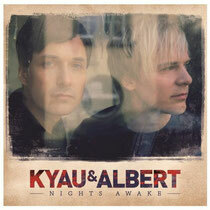 ‘Nights Awake’ is the new artist album from Kyau & Albert and features 15 songs ranging from emotive love songs to full on, hands-in-the-air club tracks. Fans of the duo will recognise ‘A Night Like This’ and ‘Another Time, two tracks that were both in heavy rotation for much of 2012 on satellite giant SiriusXM [BPM]. Utilizing their skills as songwriters Kyau & Albert have crafted an album that fans of electronic music, no matter their genre of choice, should enjoy. Collaborations abound on the album such as; ‘We Own The Night’ with Stoneface and Terminal, ‘Euphonia’ with Ronski Speed, ‘Could You Fall’ with Adaja Black and their mix of ‘Open My Eyes’ with Paul van Dyk. Listeners should be swept up in the emotional current of the album’s tracks and become intertwined in the prose of unrequited love, confessions, beginnings, endings, acceptance and the release of all these things on the dance floor. This is the duo’s third studio album and the culmination of one and half years of studio work and countless demo testing to audiences each time they played until finally they felt it was exactly the album they had envisioned. It’s out Feb 25.